We’d love your help. 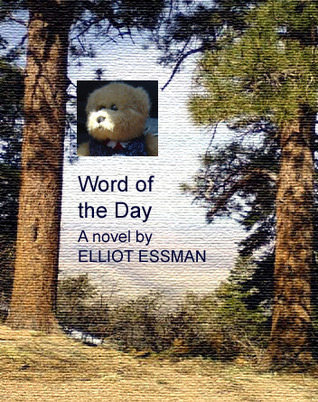 Let us know what’s wrong with this preview of Word of the Day by Elliot Essman. In this young adult coming of age novel, when a family feud between her born-again aunt and her Buddhist uncle threatens to keep her two young cousins from seeing each other, sixteen-year-old Vonnie Green tries to intervene, but fails miserably. Her New Age mother, with her crystals and tarot cards, proves more an annoyance than a help. Her best friend gets involved in the In this young adult coming of age novel, when a family feud between her born-again aunt and her Buddhist uncle threatens to keep her two young cousins from seeing each other, sixteen-year-old Vonnie Green tries to intervene, but fails miserably. Her New Age mother, with her crystals and tarot cards, proves more an annoyance than a help. Her best friend gets involved in the troubles of another girl just when Vonnie needs her help and advice. The boy she likes seems more interested in introducing Vonnie to gourmet food than in kissing her. Even her teddy bears refuse to cooperate. To ask other readers questions about Word of the Day, please sign up. I read a lot of this kind of book for young adults, being one, of course. This is one of the best. I really identify with Vonnie and her problems. My own life is so much different but still we have a lot in common. I laughed and cried. When you do both, you know the book is good. Originally trained as an attorney, and still quite active as a public speaking trainer and coach, Elliot Essman has more recently established himself as a stimulating food and a wine writer. Elliot was nominated for the James Beard Foundation Journalism Award in 2005 for his writing in the "Beer, Wine or Spirits" category. A great music lover, Elliot is creator of the musical comedy "Meet Me At The Originally trained as an attorney, and still quite active as a public speaking trainer and coach, Elliot Essman has more recently established himself as a stimulating food and a wine writer. Elliot was nominated for the James Beard Foundation Journalism Award in 2005 for his writing in the "Beer, Wine or Spirits" category. A great music lover, Elliot is creator of the musical comedy "Meet Me At The Mall" as well as the blues album "Blues Cookbook."